Look At That Bridal Glow: PeeCee Proves That *Love* Is The Best Kept Beauty Secret! 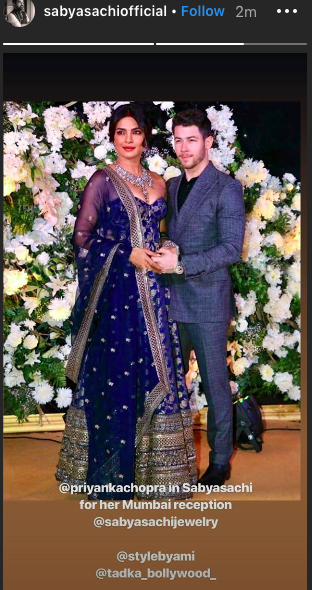 If you've been keeping up with the Chopra's and Jonases you'd know that our favourite Desi girl aka Priyanka Chopra married Nick Jonas in Udaipur a few days ago. Their wedding was nothing less than a fairytale and the fairytale continues! 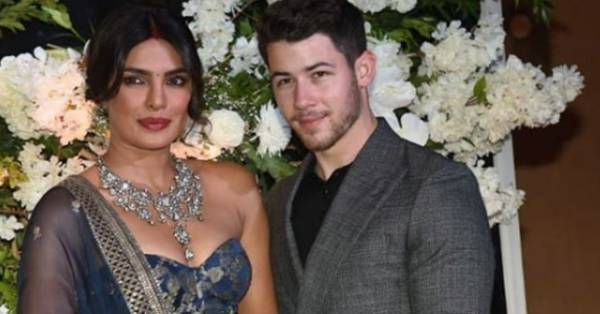 Tonight, PeeCee and Nick are hosting a reception in Mumbai and PeeCee looks beautiful in a blue and silver Sabyasachi gown. She has paired the unique gown with a beautiful, chunky silver neckpiece that's also Sabyasachi. The actress was styled by Ami Patel. PC's outfit is very western, yet Indian. Her look tonight seems to combine the best of both worlds! The diva's hair and makeup too is understated, conventional Indian elegance at it's best. As per the usual, PeeCee sported glowy skin with a statement lip, a hint of blush and kohl-rimmed eyes. The element that brought her entire look together was that pretty little bindi! I'm also loving the brick red lips. Of course the nayi dulhan is also rocking a line of sindoor in her maang. Throughout her entire wedding festivities, there's been one common element and that's her statement lipstick. We've broken down PeeCee's makeup look for her wedding here, and you're not going to believe just how (little) her makeup cost!